C-424's were built between 04-1963 and 05-1967. Options were dynamic brakes, several sizes of fuel tanks. Steam generators and hi-hoods were not offered. Phase 1 Had an overhang at rear for the numberboards and the classification lights. Two horizontal slots for the engine inertial air intake filters. Battery boxes on walkways ahead and behind cab. Phase 2 Overhang at rear for the numberboards and the classification lights was eliminated. Numberboards were in an notch at top. Class lights were moved down on the rear just below the notch. Cab angled across entire front. Single vertical rectangular inertial inlet slot for the engine inertial air intake filters. Battery boxes on walkways ahead and behind cab. Phase 3 As Phase 2 except the battery boxes were moved from the cab area to just below the rear walkways. Most Phase 3's were built by Montreal Locomotive Works(MLW). C-425's were built from 10-1964 to 12-1966. Options were dynamic brakes, several sizes of fuel tanks and Hi-Hoods. Steam generators were not offered. Phase 1 A 4" wider area below the radiator intake ducts is the major difference between the Phase 2 C-424 and the Phase 1 C-425. Numberboards were in an notch at top. Class lights were on the rear just below the notch. Cab angled across entire front. Single vertical rectangular inertial inlet slot for the engine inertial air intake filters. Phase 2 As Phase 1 except the battery boxes were moved from the cab area to just below the rear walkways. 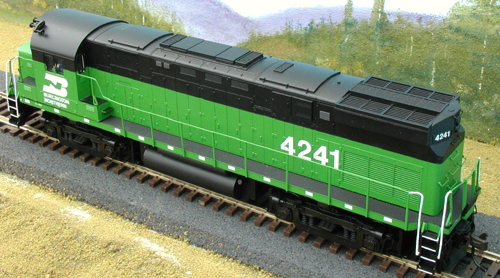 P/N 7587 PROTO 2000 Diesel Alco C424/425 Locomotive - Powered -- Burlington Northern #4243 (green & black w/white Lettering) Atlas HO Model Shown. 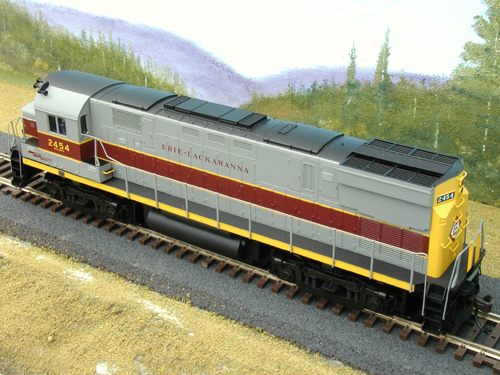 P/N 7589 PROTO 2000 Diesel Alco C424/425 Locomotive - Powered -- Erie Lackawanna #2404 (gray/maroon/yellow) Atlas HO Model Shown. P/N 7591 PROTO 2000 Diesel Alco C424/425 Locomotive - Powered -- Norfolk & Western #423 (black w/Hamburger Herald) Atlas HO Model Shown. P/N 7593 PROTO 2000 Diesel Alco C424/425 Locomotive - Powered -- Penn Central #2426 (black w/white Lettering). 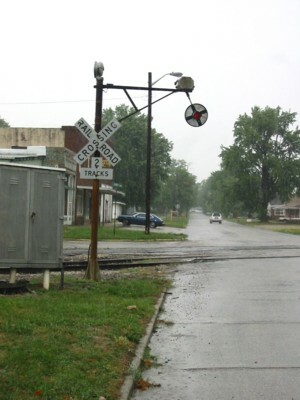 Atlas HO Model Shown.